What is The Darfur Genocide? The Difference Between the Armenian Genocide and the Darfur Genocide? Some authors try to equate people who dismiss the Armenian Genocide label because of lack of evidence, with people who generally deny genocides with the intent to hate and promote racism. There is a difference. Darfur, Sudan, is one of those sad stories that has been correctly labeled as the first genocide of the 21st century. What makes the Darfur Genocide a correct label, and the Armenian Genocide a wrong label? Well in Darfur, the government of Sudan and it's soldiers are conducting the massacres. This proves intent to kill and drive away other ethnic people the state labels as enemies, away from their lands. The videos show proof of the killings and by whom they are being committed. The Armenian Genocide, is said to have taken place in 1915, in the midst of World War I, when governments make hasty decisions that endanger the lives of others as well as their own citizens for the well-being of the nation. In 1915, the CUP (Committee of Union & Progress) Ottoman government, ordered that all Armenians in specific provinces that were suspected of hiding rebels and sabotaging the Ottoman war effort, be temporarily exiled to the Ottoman province of Aleppo, Syria. Armenian scholars argue, that this was genocide, because of the amount of death tolls by Armenians usually estimated between 600,000-800,000 that the Ottoman government was responsible for genocide. They can reach this conclusion because they do not examine the Ottoman-Turkish archives and they subjectively pick and choose which quotes and sources to use while ignoring ones that disprove the Armenian Genocide thesis. To this day, not one Armenian historian or any scholar has been able to provide solid proof that the intention of the Ottoman government was to annihilate Armenians. The only change over the past 93 years since the massacres and ethnic conflict, has been researchers discovering that there are tons of documents in the Ottoman-Turkish archives that support the CUP government's decisions to stop the massacres of Armenians. Telegrams were found that Talat Pasha wrote to governors to cease the relocations and discouraged the killing of innocent Armenians. Research continues to this day, as new historians are able to access more archives and new archeological data provides new information. To claim that the debate is over should be taken with a grain of salt. The government had suspected Armenian groups working with the Russians to create an independent Armenia. The Armenains even established a rebel organization called the Armenian Revolutionary Federation (ARF Dashnaks) which was established in 1890. The ARF practiced guerrilla warfare, cutting telegraph lines, raiding Ottoman supply lines, raiding villages and splitting the Ottoman army into smaller groups using hit & run tactics, all so that the Russians can have the upper hand and help them create a free Armenia just like they did for Bulgaria. After the Van rebellion, the government ordered on May 27th 1915 that all Armenians in Eastern Turkey be relocated and reasons were listed for this course of action. Regulations were published to provide for the safety and well-being of innocent Armenians. The British invasion from Iraq was becoming dangerous, so relocations of Armenians to Mosul and Iraq were stopped because of the fear that the Armenians would help the Allies there. We know today, that the Ottoman fears were only the tip of the iceberg because in 1918, the Ottoman Empire did collapse due to foreign intervention as feared. The Ottoman Empire was to be left with only a small portion of land east of Istanbul. The Armenian rebels were victorious because in the Treaty of Sèvres of 1920, they were to receive a large portion of land in Eastern Turkey. However, after Mustafa Kemal Ataturk (first president of Turkey) led an independence war and became victorious, the republic of Turkey was founded and the borders of Turkey today were established in the Treaty of Lausanne of 1923. However, Armenians were forced to essentially give away the Armenian lands that Armenians believed they had earned. To this day, a large majority of Armenians believe that much of Eastern Turkey rightfully belongs to Armenia, and today, they use the propaganda through the campaign of recognition of the Armenian Genocide or "the cause", in many nations to pressure Turkey to pay reparations (possibly land) and apologize for the Armenians that died even though the Turkish government has no relation to the Ottoman government. The Ottoman CUP government of 1915 did not order any massacres or killings of Armenians, so to blanket this complex history with the word genocide, is ignoring the facts and accepting a conclusion without forming one out of evidence. Hence, it is incorrect to label the Armenian massacres in 1915 as genocide. The Darfur Genocide began in February 2003, when rebellions were started by the Justice and Equality Movement (JEM) and the Sudanese Liberation Army (SLA), who accused the government of oppressing non-Arabs and favoring the Arabs, and neglecting the Darfur region in West Sudan. The Sudanese government responded with aerial bombardments, joint-strikes on tribes with the Janjaweed. Together with the Sudanese Military they have consistently burnt down villages and displaced over 2,500,000 people. Together they have killed between 200,000 to 400,000 people. The government has restricted the press and put many people in jail to silence the opposition. Human rights violations, video and photographic evidence show the extent of the damage. Though the United Nations has refrained from calling it genocide, because "genocidal intent appears to be missing." However, this means that the United Nations will call it genocide if the intent becomes apparent. The Sudanese government has been covering up forensic evidence and tampering with mass graves. They probably even destroy any sort of written evidence that may be hinting at genocidal intent. Watch the 'Darfur Now' Trailer. They seem very similar to each other. Both of them involve large populations being displaced or killed. However, closer examination reveals some sharp differences that allow researchers to draw their own inevitable conclusion. In 1915, there were very few methods of mass killing (except by using great amounts of man power and expensive ammunition; which the Ottomans could not afford to lose). No evidence of gases were used by the Ottoman Empire, since they were too poor to afford it. In Darfur, Sudanese government has used aerial bombardment and has the ability to use numerous methods of mass murder. 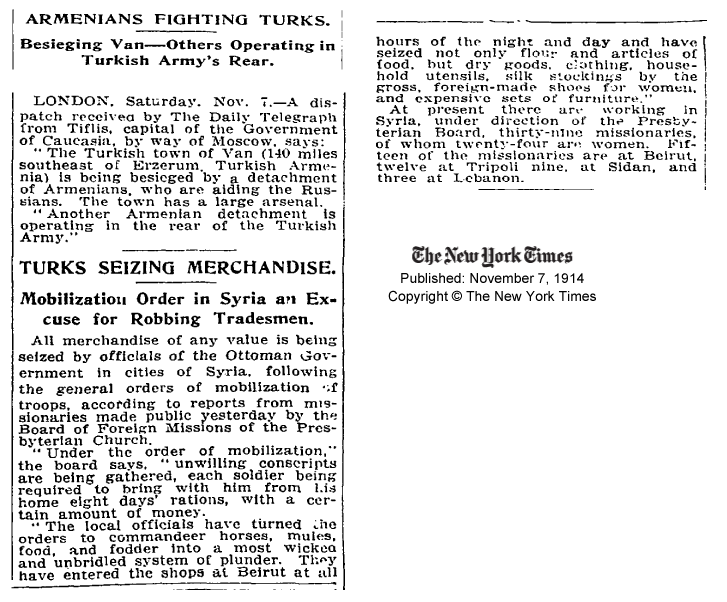 Once again, especially at a time when the state is engaged in war, the most recent rebellions which have occurred in Zeitun, Bitlis, Sivas and Van have demonstrated the continuing attempts of the Armenian committees to obtain, through their revolutionary and political organizations, an independent administration for themselves in Ottoman territory. These rebellions and the decision of the Dashnak Committee, after the outbreak of war, immediately to incite the Armenians in Russia against us, and to have the Armenians in the Ottoman state rebel with all their force when the Ottoman army was at its weakest, are all acts of treason which would affect the life and future of the country....Naturally, as the Ottoman government will never condone the continuation of such operations and attempts, which constitute a matter of life and death for itself,...it has felt the necessity to promptly close down all such political organizations. You are therefore ordered to close down immediately all branches, within your province, of the Hinchak, Dashnak, and similar committees; to confiscate the files and documents found in their branch headquarters, and ensure that they are neither lost nor destroyed; to immediately arrest all the leaders and prominent members of the committees, together with such other Armenians as are known by the Government to be dangerous; further to gather up those Armenians whose presence in one area is considered to be inappropriate, and to transfer them to other parts of the province or sanjak [district], so as not to give them the opportunity to engage in harmful acts; to begin the process of searching for hidden weapons; and to maintain all contacts with the [military] commanders in order to be prepared to meet any possible counter-actions. Because some of the Armenians who are living near the war zone have obstructed the activities of the Imperial Ottoman Army, which has been entrusted with defending the frontiers against the country's enemies; because they impede the movements of provisions and troops; because they have made common cause with the enemy; and especially because they have attacked the military forces within the country, the innocent population, and the Ottoman cities and towns, killing and plundering; and because they have even dared to supply the enemy navy with provisions and to reveal the location of our fortified places to them; and because it is necessary that rebellious elements of this kind should be removed from the area of military activities and the villages which are the bases and shelter for these rebels should be vacated, certain measures are being adopted, among which is the deportation of the Armenians from the Van, Bitlis, Erzerum vilayets; the livas [“countires”] of Adana, Mersin, Kozan, Jebelibereket, except for the cities of Adana, Sis and Mersin; the Marash sanjak, except for the Marash itself; and the Iskenderum, Beylan, Jisr-I Shuur, and Antakya districts of the Aleppo vilayet, except for the administrative city of each. It is being announced that the Armenians are to be sent to the following places: Mosul vilayet except for the northern area bordering on the Van vilayet, Zor sanjak, southern Urfa except for the city of Urfa itself, eastern and southeastern Aleppo vilayet, and the eastern part of the Syrian vilayet. Article I: In time of war, the Army, Army Corps, and Divisional Commanders their Deputies, and the Independent Commanders, are authorized and compelled to crush in the most severe way, and to eradicate all signs of aggression and resistance by military force, should they encounter any opposition, armed resistance and aggression by the population, to operations and measures relating to orders issued by the Government for the defense of the country and the maintenance of order. Article II: The Army, Army Corps, and Divisional Commanders are authorized to transfer and relocate the populations of villages and towns, either individually or collectively, in response to military needs, or in response to any signs of treachery or betrayal. Article III: This provisional law will come into effect when it is published. Article IV: The Acting Commander-in-Chief and the Minister of War is [sic] responsible for the implementation of the articles of this law. In Darfur Genocide, no such orders are written about or published. And it seems that the ethnic groups that are being driven away are the same, and they are being driven out of Sudan to the West without exceptions. In the Ottoman Empire, there were Armenian officials and members of the government and armed forces. Hence it is impossible to say that there was any long-lasting ethnic hatred towards Armenians. The hatred of locals was directed at Armenian rebels, but little was done to distinguish between rebels and the innocent by the locals (this would explain the massacres). 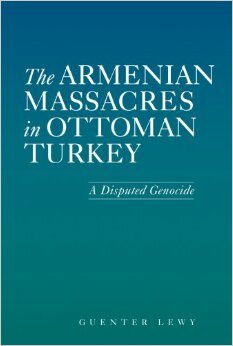 The massacres of Armenians were largely done by Kurds and local Muslims usually provoked by Armenian rebellions. In Darfur, it was initially a response to rebellion, but has changed to fit a more deporting and extermination campaign. In the Ottoman Empire the Armenians exiled were relocated to other Ottoman territory, not outside the Ottoman Empire, and they were allowed to return to their homes, though some chose to flee the empire. The Ottoman Empire was in a 3-front war against several powerful European enemies. It did not have the man-power, money, or motivation to perpetrate and plan a genocide. Extermination had no benefit or value to the Ottoman government; in contrast, it was beneficial to protect the Armenian minorities because the Allied powers, including the Ottoman's German ally felt sympathy for the Armenians because they were Christian. Missionaries reporting massacres of Armenians only damaged the Ottoman image of tolerance and freedom, this was not the goal of the Ottoman Empire. In Darfur, there is no war, except against the rebels and civilian population. It seems more like an extermination or deportation campaign to get rid of ethnic rivals. In the Ottoman Empire, Armenians were viewed as the "Loyal nation", and Turks sympathized with them, only disagreeing on religion. However, many Armenians were quite wealthy and were not segregated from the Turkish population until the relocation decree. Ottoman military commanders arrested, tried, and sometimes executed over 1,630 Turks (sometimes officials or soldiers) and Kurds who were responsible for crimes against the Armenian minority or the relocation convoys. No such action was seen by the Sudanese government. The relocation orders during 1916 were counter-acted by Talat Pasha, who saw that it was only hurting the Armenian minority and that most of the rebels were already gone. In Darfur, Sudanese military seems to be aware of the situation, even helping to cover up mass graves, and attacking tribes and villages together with the Janjaweed, under direct orders from their government. Even in 1916 until today, many Armenians still live inside Turkey. It shows that there was no ethnic hatred towards Armenians, only local tensions that caused ethnic conflicts. It also shows that Armenians and other Christians were not being targeted for their religion or ethnicity. It shows the government's actions were there to stop rebellions that were negatively affecting the war effort against Russia (invading from the North), French (invading from the South), and Britain (invading from the South East). Almost all the ethnic groups declared as enemies, have been displaced or killed in Darfur. The death toll of Armenians ranges from 200,000 to 800,000 because of the limitations of technology such as transportation, even railroads were non-existent in many areas, but in places where railroads were available, tickets were given to Armenians being relocated. Limitations in medicine and food shortages also caused great death tolls for Armenians. However, these killing-factors were also true for the Turkish population and the Turkish military at the time who lost an average of 30% of their fighting force to disease and hunger. Many Ottoman armies went to battle hungry and it cost the Ottoman armies many defeats all over the empire. In Darfur, the killing-factors are only affecting the non-Arab and non-Janjaweed populations, showing that there is intent to kill. This should clear up some misconceptions. We must always be aware of other genocides to never allow them to occur ever again, and to act together to fight and condemn genocide whenever we can. However, we must not be hasty in judgment and automatically assume that because a government is accused of genocide then it must be true. Such assumptions only increase ethnic hatred and prejudice around the world, that Turks face to this day, even though the people Armenians blame for genocide died almost a century ago. Playing the blame game and accusing governments of massacres without evidence increases the prejudice and ethnic hatred amongst different people in many regions. However, it is very evident that this hatred is exactly what the Armenian lobby wants, because of their inherent belief since their childhood education that Armenians are superior to Turks. The blame game is not always a cause for justice or reconciliation. The blame game can be used as the basis for prejudice, hate, and racism. In other words, while Antisemitism of the denial of the Holocaust creates hate against Jews. The blame of an unproven genocide against the Turks creates Anti-Turkism. The hundreds of thousands of Turks who died between 1890-1923 (coincidentally starting around the same time the Armenian Revolutionary Federation was established) or the millions of Turks who died in the Balkan wars because of ethnic conflict should not be ignored. The Irony is, Wikipedia which is patrolled by Armenian nationalists and Armenian-friendly administrators to promote propaganda on the "Armenian Genocide" article. Take a look at all the mistakes in wikipedia. The debate rages for the Armenian Genocide, but because of the very hypocritical anti-Turkish administrators. Though there are some good Armenians and Turks who try to stop nationalist propaganda, they are silenced by the majority who promote it. In contrast, the Darfur Genocide is labeled as "The Darfur Conflict" or "Darfur War" in Wikipedia even though it is most certainly genocide. Genocide should be stopped, but more importantly, genocides that are being perpetrated currently are of higher priority than a controversial and debated rebellion 93 years ago. Of course, it has become habit for our Western world to feel sympathy towards Christians being persecuted or oppressed, while being indifferent or uncaring to Muslims (Azeri Genocide, Turkish massacres by Armenian rebels, and the Bosnian Genocide) being oppressed or massacred. It is time we study each genocide and ethnic, racial, or religious conflicts with open-minds without name-calling like "Denialist" or "revisionists" and without prejudice or hasty conclusions. While at the same time we should interfere with conflicts that are occurring right now regardless of whether it is or is not genocide. So ask your politicians to stop promoting legislation about 93 year old events that are still debated and largely controversial and ask them to take action now to stop current massacres and ethnic conflicts regardless of whether it is genocide or not.